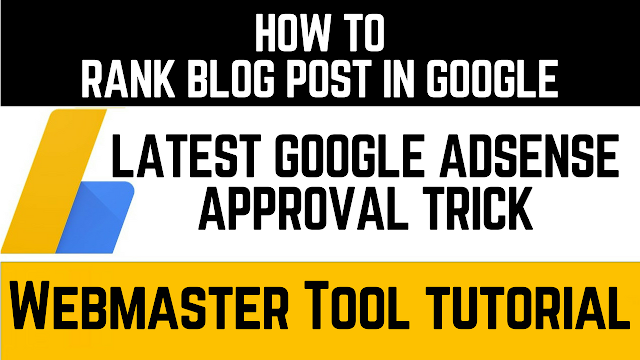 Google Adsense approval trick for blogger🔥Rank blog post in Google🔥Webmaster Tool tutorial. "How to get Google Adsense approved for blogger. How to get non hosted Adsense account 2018. fully approved Adsense account. This video will explain the tricks to rank your Blog post in the 1st page of Google in 2018. This trick helps Google crawler to find your blog and increase the traffic to your blog. The best ranking trick of the blog in 2018. Google Webmaster Tools: How to Set-up, Use & Benefit From The Google Search Console. Google Webmaster Tools (Google Search Console) is an essential tool for websites to understand how Google crawls and sees a website. Google provides valuable tips for improving a website so they can better crawl and rank a website.